Objectives To compare the efficacy and safety of innovator infliximab (INX) and CT-P13, an INX biosimilar, in active rheumatoid arthritis patients with inadequate response to methotrexate (MTX) treatment. Methods Phase III randomised, double-blind, multicentre, multinational, parallel-group study. Patients with active disease despite MTX (12.5–25 mg/week) were randomised to receive 3 mg/kg of CT-P13 (n=302) or INX (n=304) with MTX and folic acid. The primary endpoint was the American College of Rheumatology 20% (ACR20) response at week 30. Therapeutic equivalence of clinical response according to ACR20 criteria was concluded if the 95% CI for the treatment difference was within ±15%. Secondary endpoints included ACR response criteria, European League Against Rheumatism (EULAR) response criteria, change in Disease Activity Score 28 (DAS28), Medical Outcomes Study Short-Form Health Survey (SF-36), Simplified Disease Activity Index, Clinical Disease Activity Index, as well as pharmacokinetic (PK) and pharmacodynamic (PD) parameters, safety and immunogenicity. Results At week 30, ACR20 responses were 60.9% for CT-P13 and 58.6% for INX (95% CI −6% to 10%) in the intention-to-treat population. The proportions in CT-P13 and INX groups achieving good or moderate EULAR responses (C reactive protein (CRP)) at week 30 were 85.8% and 87.1%, respectively. Low disease activity or remission according to DAS28–CRP, ACR–EULAR remission rates, ACR50/ACR70 responses and all other PK and PD endpoints were highly similar at week 30. Incidence of drug-related adverse events (35.2% vs 35.9%) and detection of antidrug antibodies (48.4% vs 48.2%) were highly similar for CT-P13 and INX, respectively. Conclusions CT-P13 demonstrated equivalent efficacy to INX at week 30, with a comparable PK profile and immunogenicity. CT-P13 was well tolerated, with a safety profile comparable with that of INX. Based on the data described, this trial, PLANETRA (Programme evaLuating the Autoimmune disease iNvEstigational drug cT-p13 in RA patients), was conducted with the approval of the regulatory authorities including EMA. PLANETRA was designed to assess efficacy equivalence and to evaluate pharmacokinetics (PK), PD and overall safety of multiple doses of CT-P13 versus INX in active RA patients. Patients with active RA according to the revised 1987 American College of Rheumatology (ACR) classification criteria for ≥1 year prior to screening were recruited. Patients had to have ≥6 swollen and ≥6 tender joints and at least two of the following: morning stiffness lasting ≥45 min; serum C reactive protein (CRP) concentration >2.0 mg/dl and erythrocyte sedimentation rate (ESR) >28 mm/h despite methotrexate (MTX) therapy for ≥3 months (stable dose of 12.5–25 mg/week for ≥4 weeks prior to screening). Patients were permitted to receive both oral glucocorticoids (equivalent to ≤10 mg daily prednisolone) and non-steroidal anti-inflammatory drugs, if they had received a stable dose for ≥4 weeks prior to screening. Additional details of patient eligibility criteria are provided online (see online supplementary appendix B). The study (ClinicalTrials.gov NCT01217086) was conducted according to the Declaration of Helsinki and the International Committee on Harmonisation good clinical practice. The protocol was reviewed and approved by regulatory authorities and the ethics committees of each study site. Written informed consent was obtained from all patients. The study was conducted at 100 centres across 19 countries in Europe, Asia, Latin America and Middle East. Patients were randomly assigned 1:1 to receive 2 h intravenous infusion of either 3 mg/kg of CT-P13 (CELLTRION INC, Incheon, Republic of Korea) or INX (Janssen Biotech Inc, Horsham, Pennsylvania, USA) at weeks 0, 2 and 6 and then q8 weeks up to week 30. Patients were premedicated with antihistamine (chlorpheniramine 2–4 mg or dose of equivalent antihistamine) 30–60 min prior to the start of infusion at the investigator's discretion. Weekly MTX (12.5–25 mg/week, oral or parenteral dose) and folic acid (≥5 mg/week, oral dose) were coadministered. Rescue therapy was only allowed with tramadol and/or acetaminophen. Salvage therapy was defined as an antirheumatoid drug, such as disease-modifying antirheumatic drugs, non-steroidal anti-inflammatory drugs and any biological agent for the treatment of RA, received on or after the day of the first dose of study treatment. The primary endpoint was to demonstrate equivalent efficacy of CT-P13 to INX at week 30, as determined by ACR20 response criteria. Equivalence of efficacy was concluded if the 95% CIs for treatment difference were within ±15% at week 30. Blood samples collected at screening and weeks 14 and 30 were assessed for antidrug antibodies (ADA), and a post hoc analysis of endpoints by ADA status was conducted. Immunogenicity testing used both the CT-P13 tag and INX tag (see online supplementary appendix C). Antibodies against CT-P13 or INX were measured using an electrochemiluminescent immunoassay method using the Meso Scale Discovery platform (MSD, Rockville, Maryland, USA). Safety endpoints included incidence and type of adverse events (AEs) and infection, serious AEs, incidence of infusion-related reactions and changes from baseline in clinical laboratory parameters. AEs were coded using the Medical Dictionary for Regulatory Activities and severity was characterised as mild, moderate or severe. PK endpoints included Cmax, Cmin, Cav,ss, peak to trough fluctuation ratio and time to reach Cmax (Tmax). PD endpoints included concentrations of serum CRP, rheumatoid factor (RF) and anticyclic citrullinated peptide (anti-CCP) and ESR. Serum blood samples were obtained immediately before each dosing for PK and PD analyses, and at the end and 1 h after the end of each treatment infusion for PK analysis. All PK analyses were conducted using a flow-through immunoassay platform (GyrolabxP; Gyros AB, Sweden). All primary efficacy analyses were performed on both the intention-to-treat (ITT) and PP populations. All other efficacy analyses were performed on the PP population only. The proportion of patients achieving ACR20 response at week 30 was analysed by the exact binomial approach, calculating a point estimate and 95% CIs for the difference in proportion between the two treatment groups. The equivalence margin within ±15% at week 30 was selected based on recommendations from regulatory bodies8 ,9 and historical data from clinical trials of INX plus MTX in RA.1 ,10–13 A weighted average for the treatment difference in ACR20 response between the INX plus MTX and placebo plus MTX was nearly 30%, and so the equivalence margin of 15% was considered appropriate. A sensitivity analysis considering stratification factors was also performed, accounting for region (EU or non-EU) and serum CRP (≤2 mg/dl or >2 mg/dl). The exact binomial and sensitivity analyses were repeated for the secondary ACR response criteria. Time-to-onset of ACR20 response was analysed by survival analysis. Descriptive statistics for change from baseline were presented by randomised treatment group and study visit for DAS28, EULAR response, SDAI, CDAI and SF-36 subscales. 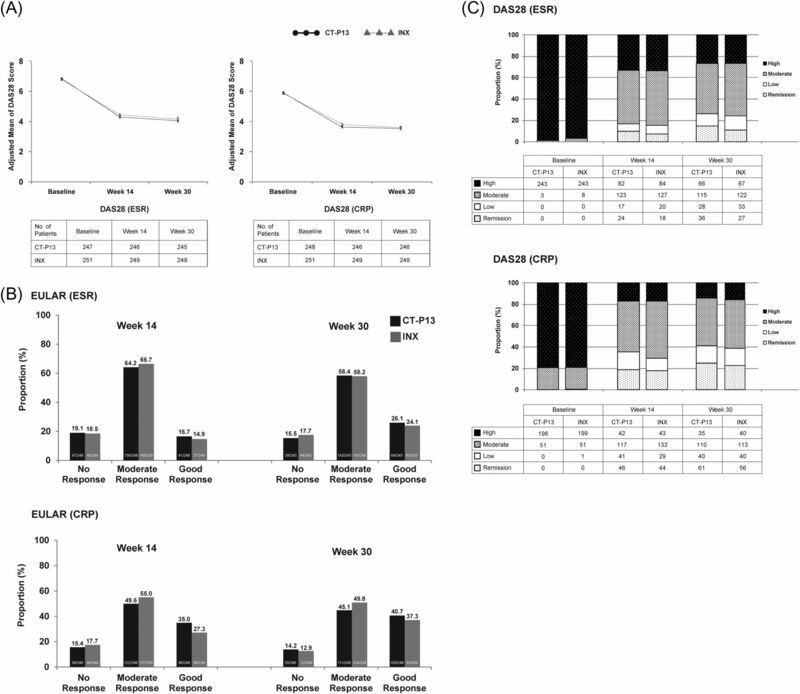 An analysis of covariance for DAS28 was performed with treatment group as a fixed effect and baseline DAS28 score, region and CRP as covariates. A point estimate and 95% CI for the treatment difference were provided. The EULAR response criteria were analysed using a relative risk (RR) with 95% CI for the difference in response between the two treatment groups. The number of patients requiring salvage retreatment was summarised by randomised treatment group and visit. Safety endpoints analysed in safety population consisted of all patients who received at least one (full or partial) dose of either of the study treatments during any dosing period. In this population, patients were included in the CT-P13 group for safety analyses, irrespective of their randomisation if they received at least one (full or partial) dose of CT-P13. The PK–PD population consisted of all patients who received either CT-P13 or INX during the 30-week blinded study period and had at least one PK–PD concentration data value. PK–PD parameters were summarised using quantitative descriptive statistics by actual treatment group and study visit. The first patient was screened in November 2010; the last week 30 evaluation was performed in November 2011. Baseline demographics and disease status were comparable between treatment groups (table 1). Of the 606 randomised patients, 515 completed the 30-week study period and, of these, 16 patients were excluded from the PP population due to major protocol violations. Discontinuation in randomised patients was primarily due to AEs (8.9%) and patient withdrawal of consent (4.1%) (figure 1). Flowchart of patient disposition. A total of 1077 patients were screened for the study, and 606 eligible patients were randomised into a CT-P13 group (N=302) or an innovator infliximab (INX) group (N=304) to receive 3 mg/kg of CT-P13 or INX, respectively, coadministered with methotrexate (MTX) and folic acid. All 606 randomly assigned patients were included in the intention-to-treat population. A total of 107 out of 606 randomised patients were excluded from the per-protocol population due to the various protocol violations. *Eleven patients from a potentially fraudulent study site were excluded from analyses. 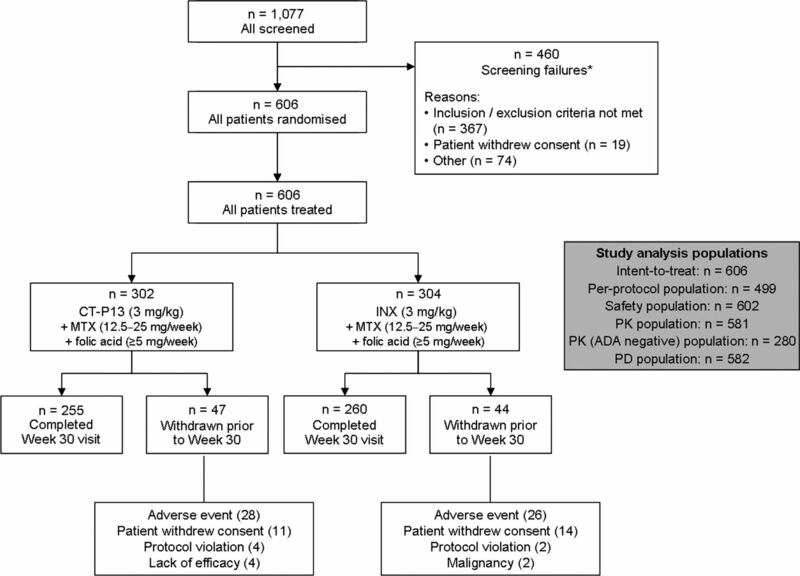 The primary endpoint, ACR20 response at week 30, was equivalent between treatment groups and achieved in 60.9% and 58.6% in ITT (n=606, 95% CI −6% to 10%) and 73.4% and 69.7% in PP population (n=499, 95% CI −4% to 12%) for CT-P13 and INX, respectively (figure 2A). American College of Rheumatology (ACR) response rates. (A) ACR20 improvement criteria at week 30 (primary efficacy endpoint) for the intention-to-treat (ITT) (N=302 and 304 in CT-P13 and innovator infliximab (INX) groups, respectively) and per-protocol (PP) populations (N=248 and 251 patients in CT-P13 and INX groups, respectively). (B) ACR20, ACR50 or ACR70 improvement criteria at week 14 for the PP population. (C) ACR50 or ACR70 improvement criteria at week 30 for the PP population. ACR20, ACR50 and ACR70 are the ACR 20%, 50% and 70% improvement criteria, respectively. 95% CI was calculated by the exact binomial method. 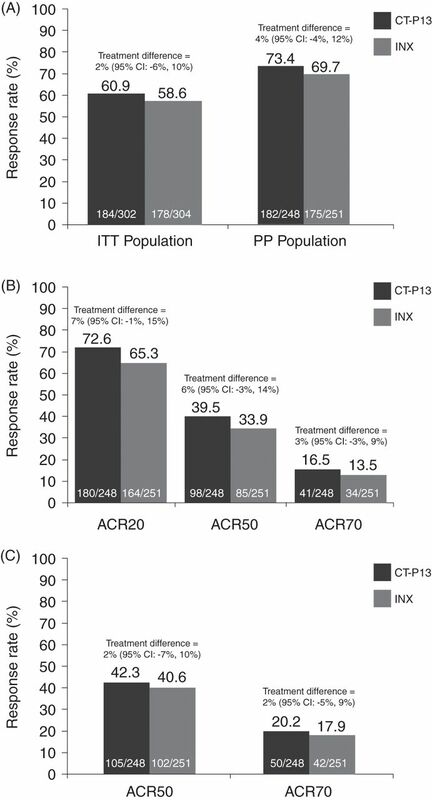 Equivalent results were also shown for ACR responses in the PP population at weeks 14 and 30 (figure 2B,C) for CT-P13 and INX, respectively. ACR50 and 70 responses in the ITT population at week 30 were comparable (35.1% and 16.6% vs 34.2% and 15.5% for CT-P13 and INX, respectively). Post hoc analysis by baseline CRP demonstrated highly similar ACR20 responses in the ITT population for CT-P13 and INX, respectively (CRP >2 mg/dl: 58.7% and 58.6%; ≤2 mg/dl: 61.9% and 58.5%). Mean improvements from baseline for additional secondary efficacy endpoints including CDAI and SDAI (CT-P13 (25.2 and 25.8) vs INX (23.6 and 24.4) at week 30, respectively) were equivalent at weeks 14 and 30 between treatment groups (table 2). The proportion in each group achieving good or moderate EULAR responses (CRP) at week 30 was highly similar (CT-P13 85.8%; INX 87.1%, RR=0.98, 95% CI 0.92 to 1.06). Low disease activity or remission according to DAS28-CRP was achieved in 40.9% and 39.0% with CT-P13 and INX, respectively (figure 3). The proportion of patients requiring salvage therapy at week 30 was also highly similar between CT-P13 (3.2%) versus INX (4.0%). The medians of time-to-onset of ACR20 of the two treatment groups were almost identical (median CT-P13, 99 days; INX, 100 days). Changes over time in the Disease Activity Score in 28 joints (DAS28) and European League Against Rheumatism (EULAR) responses for CT-P13 (3 mg/kg) and innovator infliximab (INX) (3 mg/kg) treatment in the per-protocol population. (A) Adjusted mean DAS28 score based on erythrocyte sedimentation rate (ESR) and C reactive protein (CRP) at baseline, weeks 14 and 30. Error bars represent SE. (B) EULAR response criteria based on DAS28 score at weeks 14 and 30 following treatment. (C) Disease activity based on DAS28 (ESR) and DAS28 (CRP) at baseline, weeks 14 and 30. In addition, ACR/EULAR remission rates were comparable for CT-P13 and INX at week 30 (Boolean: 6.9% (17/248) and 6.8% (17/251); SDAI: 9.7% (24/248) and 9.6% (24/251)). Efficacy criteria were also analysed according to ADA status at week 30 (see online supplementary appendix D). Overall, no statistically significant differences in responses between the two treatment groups were found. Antibodies to infliximab were detected using INX tag in 25.4% (n=69) and 25.8% (n=70) of patients for CT-P13 and INX at week 14 and 48.4% (n=122) and 48.2% (n=122) of patients for CT-P13 and INX, respectively, at week 30. Overall treatment-emergent AEs (TEAEs) were reported in 181 (60.1%) patients and 183 (60.8%) patients for CT-P13 and INX, respectively. TEAEs considered related to study treatment were reported in 106 (35.2%) and 108 (35.9%) patients for CT-P13 and INX, respectively (table 3). The majority of TEAEs were mild-to-moderate in intensity. The TEAEs considered by the investigator to be related to the study treatment and most frequently reported for patients were—CT-P13: latent TB (positive conversion of QTF, n=13), increased ALT (n=12), increased AST (n=8) and a flare of RA activity (n=7); INX: latent TB (n=14), increased ALT (n=11), increased AST (n=8) and urinary tract infection (n=7). Two patients were withdrawn due to malignancies in the INX group (figure 1), breast cancer and cervix carcinoma. Patients with latent TB were recommended for prophylactic TB medication, and latent TB in patients receiving prophylactic TB medication did not convert to active TB. There were three cases of active TB in the CT-P13 group and none in the INX group (see online supplementary appendix E). Infusion-related reactions occurred in 20 (6.6%) and 25 (8.3%) patients for CT-P13 and INX, respectively. The proportions of infusion-related reactions for CT-P13 and INX groups were 6.7% (n=9) versus 13.3% (n=18) in ADA-positive group and 4.2% (n=6) versus 2.8% (n=4) in ADA-negative group, respectively. Serious TEAEs were reported in 30 (10.0%) and 21 (7.0%) patients for CT-P13 and INX, respectively (see online supplementary appendix F). There were no deaths reported during the study. The PK and PD endpoint results were highly similar for each treatment group. In the PK population, geometric means and peak serum concentrations (Cmax) were highly similar after each infusion of study treatment for doses 1–6, as was the overall range of geometric means across all doses (CT-P13, range 83.9–111.9 μg/ml; INX, range 83.8–105.1 μg/ml). The mean secondary PK endpoints were highly similar for CT-P13 and INX (see online supplementary appendix G). In the ADA-negative subset, geometric mean Cmax values were 96.7 and 91.6µg/ml (90% CI of ratio 97% to 115%), and Cmin values were 1.9 and 1.8 µg/ml (90% CI of ratio 85% to 132%) for CT-P13 and INX at dose 5, respectively. In the ADA-positive subset, geometric mean Cmax values were 85.1 and 76.7 µg/ml (90% CI of ratio 99% to 124%), and Cmin values were 0.6 and 0.6 µg/ml (90% CI of ratio 82% to 107%) for CT-P13 and INX at dose 5, respectively. CT-P13 and INX had comparable mean CRP (1.2 vs 1.1 mg/dl and 1.1 vs 1.0 mg/dl), ESR (32.8 vs 31.0 mm/h and 30.6 vs 32.1 mm/h), anti-CCP (186.5 vs 195.4 IU/ml and 189.8 vs 174.6 IU/ml), IgA RF (41.2 vs 45.8 IU/ml and 33.9 vs 38.3 IU/ml), IgG RF (40.5 vs 33.4 IU/ml and 33.5 vs 29.5 IU/ml) and IgM RF (90.0 vs 88.0 IU/ml and 83.9 vs 82.5 IU/ml) at weeks 14 and 30, respectively. It is also interesting to note that although CRP is regarded as the better marker of inflammation, ESR may have utility in reflecting disease severity.14 ,15 However, as ESR data are not available for ATTRACT or any other placebo-controlled INX plus MTX studies in the literature, we rely on assessment of CRP to ensure appropriate comparison of patient populations. Although the point estimates of medians for time-to-onset of ACR20 were very similar, we have observed faster tendency of ACR 20 response among CT-P13 group compared with the INX group based on log-rank test result (p=0.02). ACR20 responses were measured only at weeks 14 and 30; therefore, we have a limitation to adapt statistical survival methods on a very small number of evaluation time points and conclude log-rank test results from our data. Efficacy criteria were also analysed according to ADA status at week 30, and no statistically significant difference in responses between the two treatment groups was found. However, as this was a post hoc analysis, interpretation of these results should be done with care and to a limited extent. In our study, PK and PD endpoint results were highly similar for each treatment group and antibody status had a minimal effect on the PK of infliximab. A difference was noted in the change from baseline in anti-CCP at week 30 and IgG RF at week 14. However, these two parameters are more indicative of disease severity rather than a direct marker of anti-TNFα effect. In addition, it should be noted that the assumptions of normality and homogeneity of variance were assessed for each parameter for the ANCOVA analysis. Both assumptions did not hold for anti-CCP, IgA RF, IgG RF and IgM RF, and valid conclusions for these parameters beyond investigating trends cannot be drawn. Assessment of efficacy and safety of CT-P13 in patients with RA for up to 1 year is ongoing, and the positive results of this study provide a rationale for future studies of CT-P13 in the treatment of other TNF-mediated inflammatory diseases. CT-P13 and INX were shown to be equivalent in terms of ACR20 response at week 30 in active RA patients with inadequate response to MTX treatment. Overall, CT-P13 was well tolerated and the safety profile of CT-P13 was comparable with that of INX. The authors wish to thank the patients and study personnel who made this trial possible and the PLANETRA study investigators—Bosnia: Mulic Bacic S; Bulgaria: Bichovska D, Kadinov V, Oparanov B, Rashkov R, Toncheva A; Chile: Aguirre V, Arriagada Herrera M, Barria Negron L, Goecke Sariego I; Colombia: Chalem M, Diaz Cortez M, Otero Escalante WJ, Ruiz Santacruz O, Tobias Arteaga E; Italy: Bianchi G, Cutolo M, Salvarani C; Jordan: Alawneh K; Latvia: Andersone D, Saleniece S, Saulite-Kandevica D; Lithuania: Baranauskaite A, Bukauskiene L, Kausiene R, Smilgiene V, Stropuviene S; Mexico: Abud-Mendoza C, Araiza R, Cardona Cabrera R, Cons Molina F, Diaz Jimenez A, Morales-Torres J, Pacheco-Tena C, Xibille D; Peru: Calvo A, Castaneda Jimenez M, Chalouhi El-Khouri E, Chavez Corrales J, Vidal Neira L; Philippines: Amante EJ, Baes R, Eullaran R, Lanzon A, Lucero A Jr, Navarra S, Salido E, Tan P; Poland: Brzezicki J, Brzosko M, Daniluk S, Jaworski J, Klimiuk P, Krogulek M, Racewicz A, Ruzga Z, Wiland P; Portugal: Vaz Patto J; Romania: Bojinca VC, Chicea LM, Cristei D, Ianuli-Arvunescu MA, Motoc D, Pavel M, Rednic S; Slovakia: Jancovic R, Krpciar M, Zlnay D; Spain: Blanco Garcia F, Fernández-Nebró A, Gómez Centeno A, Martín-Mola E, Ucar Angulo E; UK: Adebajo A, Byrne P; Ukraine: Amosova K, Dzyak G, Gnylorybov A, Gyrina O, Hospodarskyy I, Polyvoda S, Smiyan S, Yagensky A, Yatsyshyn R; USA: Ahn C. Editorial support (writing assistance, assembling tables and figures, collating author comments, grammatical editing and referencing) was provided by Vanessa Lane, Peter Hopkins and Rory Elsome (TVF BioLogic, London, UK) and was funded by CELLTRION Inc, Incheon, Republic of Korea. National Institute of Clinical Excellence guideline. Clinical diagnosis and management of tuberculosis, and measures for its prevention and control 2011 [Online]. 2011. http://guidance.nice.org.uk/cg117/niceguidance/pdf/english (accessed 5 Dec 2012).
. Evaluating equivalence and noninferiority trials. Am J Health Syst Pharm 2010;67:1337–43. Committee for Medicinal Products for Human Use (CHMP). Guideline on the choice of the non-inferiority margin (CPMP/2158/99). 27 July 2005. http://www.emea.europa.eu/docs/en_GB/document_library/Scientific_guideline/2009/09/WC500003636.pdf (accessed 5 Dec 2012). International Conference on Harmonisation of Technical Requirements for Registration of Pharmaceuticals for Human Use. ICH harmonised tripartite guideline: choice of control group and related issues in clinical trials (E10), dated 20 July 2000 [Online]. http://www.ich.org/fileadmin/Public_Web_Site/ICH_Products/Guidelines/Efficacy/E10/Step4/E10_Guideline.pdf (accessed 5 Dec 2012).
. Infliximab versus placebo in rheumatoid arthritis patients receiving concomitant methotrexate: A preliminary study from China. APLAR J Rheumatol 2006;9:127–30.
. A multicenter, double-blind, randomized, placebo controlled trial of infliximab combined with low dose methotrexate in Japanese patients with rheumatoid arthritis. J Rheumatol 2006;33:37–44.
. The safety of infliximab, combined with background treatments, among patients with rheumatoid arthritis and various comorbidities: a large, randomized, placebo-controlled trial. Arthritis Rheum 2006;54:1075–86.
. Twenty eight joint count disease activity score in recent onset rheumatoid arthritis using C reactive protein instead of erythrocyte sedimentation rate. Ann Rheum Dis 2003;62:681–82.
.; Active-Controlled Study of Patients Receiving Infliximab for the Treatment of Rheumatoid Arthritis of Early Onset (ASPIRE) Study Group. Predictors of joint damage in patients with early rheumatoid arthritis treated with high-dose methotrexate with or without concomitant infliximab: results from the ASPIRE trial. Arthritis Rheum 2006;54:702–10. Remicade Summary of Product Characteristics. http://www.ema.europa.eu (accessed 5 Dec 2012). World Health Organization. Global tuberculosis report, 2012. Geneva: WHO, 2012.
. Individualized monitoring of drug bioavailability and immunogenicity in rheumatoid arthritis patients treated with the tumor necrosis factor alpha inhibitor infliximab. Arthritis Rheum 2006;54:3782–9.
. Influence of immunogenicity on the efficacy of long-term treatment with infliximab in rheumatoid arthritis. Rheumatology (Oxford) 2011;50:1445–52. Contributors DHY, SJL and HUK were involved in the conception and design of the study, acquisition of data and/or analysis and interpretation of data; drafting of manuscript and revising it critically for important intellectual content; final approval of the version to be published. WP and UM-L were involved in the conception and design of the study; drafting of manuscript and revising it critically for important intellectual content; final approval of the version to be published. PH, PM, ER, MP, SS, VK, NP, MA-B, SG-U, LM-O, MT, RJ and OZ were involved in the acquisition of data; drafting of manuscript and revising it critically for important intellectual content; final approval of the version to be published. The project management, clinical and medical monitoring, pharmacovigilance (PVG), data management, analysis of pharmacokinetic (PK) data, biostatistical analysis, and medical writing were performed under contract with PPD, Inc. in collaboration with the CELLTRION, Inc. Competing interests All authors have completed the Unified Competing Interests form at http://www.icmje.org/coi_disclosure.pdf (available on request from the corresponding author) and declare: financial support for the submitted work from Celltrion: DHY, WP, MT, RJ, MA-B, PH, VK, LM-O, PM, MP, ER and SS received research grants and/or consultancy fees, and logistics support; SJL, SG-U, OZ and NP received research grants and/or consultancy fees only; HUK is a full-time employee of Celltrion. MT has received additional research grants from Celltrion and attended a Celltrion plant visit. UM-L has received payment for lectures from Celltrion.